Rules based flexible regex searching. Auto-export, auto-name (with collision avoidance), save search terms into a library. Find just about anything. SMART’s search features are among its most powerful and flexible features. Simple term. Start+stop term. Selection range term. UTF-8/16 encoding…SMART handles them all. Much more powerful and intuitive than a scripting language, SMART enables complex tasks and search result rules to be applied automatically. What can you do with search hits once you have them? Just about anything. 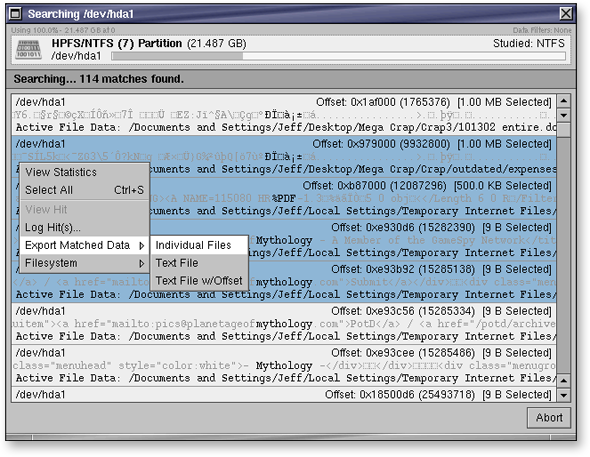 Export, log, carve, aggregate, recover deleted files…whatever.